Did you know that chewing gum, which many of you are so fond of, actually comes from a tree? Chewing gum is made from a thick juice called “chicle” which comes from within the sapodilla tree. People who take out the chicle are called “chicleros”. They make zigzag cuts along the tree trunk so that the thick white juice inside drips out and are collected in small bags. At the factory this chicle is boiled with corn syrup, glycerin, sugar and flavoring. It is then dried, rolled and cut into bite-size pieces. This is how chewing gum was originally made, though not everyone makes it from natural chicle these days. A member of the Sapotaceae family, sapodilla is native to Central and South America, specifically from the Yucatan Peninsula of Mexico to Costa Rica. But now you find it throughout the tropical regions of the world, including the West Indies, India, and Florida. Its botanical name is Manilkara zapota van Royen. 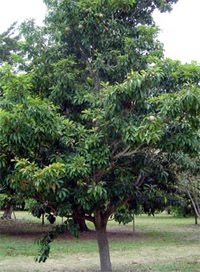 It is one of the best-loved among tropical fruit trees. 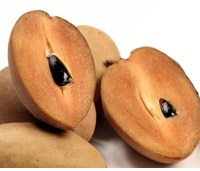 Sapodilla is also known as Chico, Chico Sapote, Zapotillo, Sapodilla plum and many other similar names. In India it is commonly known as ‘chikoo’. The sapodilla is an attractive, upright evergreen tree which is strong and wind-resistant. It can grow very tall, going up to a hundred feet in some places. The leaves are a dark glossy green and look very pretty. Sapodilla flowers are small and bell-shaped and look rather inconspicuous. The fruits are round with a brown and scruffy skin. Looking at it, you wouldn’t imagine how luscious it could taste! The flesh inside is light brown and very sweet. Some taste a bit like pears. Some others taste like crunchy brown sugar. Most people simply cut the fruit in half and scoop out the flesh with a spoon. It is an ideal dessert and tastes gorgeous with custard or in a trifle. The fruits have hard and shiny black seeds. I remember playing with them as a child. Some primary teachers use them to teach children counting games. Sapodilla wood is strong and durable. It might surprise you to know that many of the supporting beams made of sapodilla wood in the ancient Mayan temples in Mexico remain in tact to this day. People also use it for flooring, making carts, furniture, tool handles, shuttles and rulers. In many countries the sapodilla trees are not allowed to be cut down because it is a valuable source of chicle. The bark of the sapodilla tree is rich in tannin and is used by the fishermen of Philippine to color their sails and fishing lines. Sapodilla is also used for many indigenous medicines. The tannin content of the unripe fruits is said to help stomach problems. The old and yellowed leaves are said to help cold and coughs. The crushed seeds are used for treating stones in the kidney. A paste of the seeds is used to treat animal bites. But it is mostly cultivated because the fruits are so tasty. Today, sapodilla is grown on a commercial basis in India, the Philippines, Sri Lanka, Malaysia, Mexico, Venezuela, Guatemala, and some other Central American countries. In fact, India is one of the largest producers of sapodilla.